Building the H Bomb is a memoir by the author during his time as an apprentice weapons designer during the development of the world’s first hydrogen bomb. Set mainly at Princeton and Los Alamos between the summer of 1950 and the summer of 1952, this memoir includes material from recent interviews conducted by the author with physicists he had worked and photos of this period of Los Alamos and Princeton. At Los Alamos, Ford worked with future Nobelists. “There is no place else I could have been, not even back at Princeton, where I could have not just encountered, but worked closely with—so many brilliant people in such a short span of time.” The reader gets a first hand account of the personalities of some of the brilliant physicists who were working at Los Alamos with Ford including, Stanislaw Ulam, Edward Teller, and Richard Wheeler. There has always been fierce competition among physicists to be the first to publish a new discovery of nature, and naturally there were rivalries on who got credit for the H bomb. Edward Teller got the lion’s share of credit, and according to Ford’s memoir, Teller was loath to share the spotlight. Ford provides scientific context as well by with a synopsis of the physics necessary for thermonuclear weapons. Ford explains that the difference in “binding energy” is why a fusion bomb generates more energy than a fission bomb. He also notes that a fusion reaction is safer, whether for use as a weapon or for nuclear power as the raw materials have no critical mass and thus are unable to explode on their own. As for the concern as to whether Ford exposes national secrets in this explanation, he uses no mathematics other than basic arithmetic and no equations other than E=MC2. There’s also a section on the political context in the decision whether or not to build an H bomb, and with President Truman’s go-ahead to build the bomb, a crash program is started. Physicists work six-day weeks at Los Alamos, and a new building is quickly built at Princeton to support the Los Alamos effort, code named Matterhorn. Ford travels from Los Alamos to Princeton to do physics calculations at the Matterhorn site. There’s a section on testing nuclear weapons. Nuclear testing occurred mostly in Nevada, the Pacific Ocean, and Mississippi. The author witnessed three tests all in the Pacific at the island of Eniwetok. These tests were code-named Greenhouse George, Greenhouse Item, and Ivy Mike. The first two tests were precursors to the H bomb, done to demonstrate to the physicists that they were headed in the right direction. These tests used a fission bomb treated with elements that “boosted” the fission reaction and were to prove that thermonuclear burning occurred, but not so much that they went into fusion. The second test actually achieved fusion, but the scientists did not know this at the time. The effort to design, build, and test the H bomb involved 9,000 military personnel and 2,000 civilians, and the test “Mike” actually “deleted” Eniwetok, leaving a crater more than one mile wide and 164 feet deep. The effort in today’s dollars would have cost more than half a billion. The “Mike” shot was met with a combination of euphoria and dread, though Ford says he had no qualms helping to design such a destructive weapon as there was, at the time, a credible belief of an imminent attack on the United States by the Soviet Union. In the epilogue Ford lets the reader know that he became anti-war and anti-nuclear weapons in the 1970s, his conversion caused by presidents’ lies about the Vietnam War. There has been some controversy over the publication of Building the H Bomb and with the threat of censorship over national security concerns. Ford claims to have taken care in avoiding exposing secrets, and only includes bomb related information that is available in the public domain. The controversy appears overblown given the book’s content, written as popular science and eliding any detailed mathematics. The only technical illustration of an H bomb included in Building the H Bomb was previously published in Richard Rhodes’ book Dark Sun. This particular illustration is labeled in Russian and is believed to have been created from information taken by the spy, Klaus Fuchs. There also is a black and white photo of the “Mike” device but as Mike weighed 82 tons and was intended as a test, its duplication by terrorists from photo alone is highly unlikely. 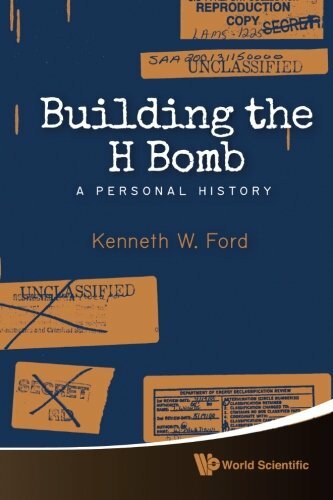 Kenneth Ford has led an interesting life, knows how to write popular science, and has produced a valuable memoir for those who are curious about the background to the conception of and the building and testing of the first H bomb. No one should worry that by reading Building the H Bomb anyone could actually build an H-bomb.